At some point when you want additional revolving credit with American Express they will request/require tax return verification. 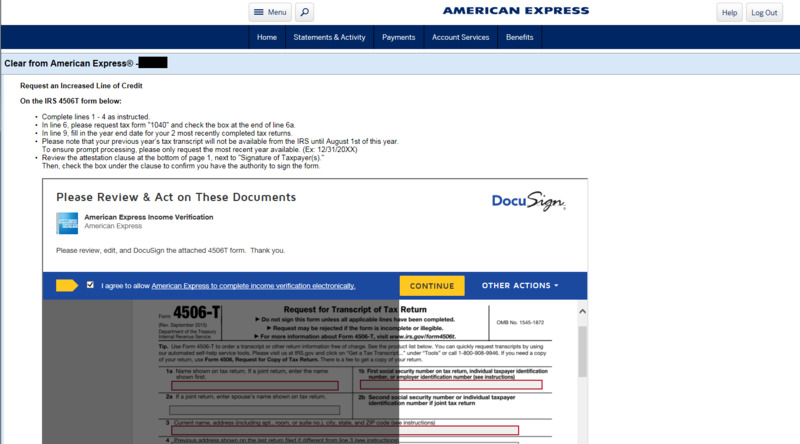 Aside from getting a legitimate credit inquiry, getting a 4506-T from Amex in response to a CLI request, while often annoying, is probably the most irrationally feared event discussed on CB. I have gone through this process with Amex three times in the past few years, and twice the process was a complete disaster (multiple delays, lost forms, escalations to supervisors and managers that yielded no results, etc). I've noted other recent anecdotes here that suggest that my experiences are not uncommon. I've even joked that Amex must have outsourced their tax return verifications to the Enneffseeyou membership department, because it's that much of a mess. 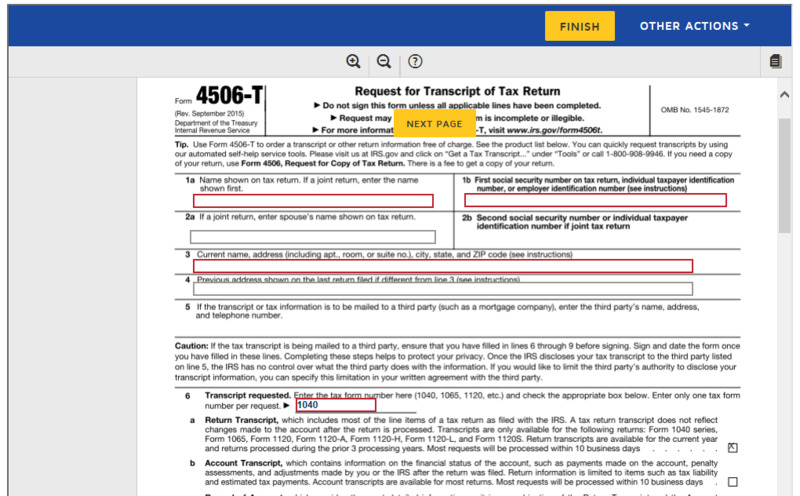 This thread is to discuss and track current experiences with the Amex tax return verification process. I initiated a 3x CLI request on my EveryDay card this morning and got the 4506-T responses, as I expected. I'll track the process with timelines beginning with my next post in this thread. 3 - Receive CLI in a couple of weeks. The 4506-T process is different from a financial review. Failure to provide the requested form simply results in no CLI. Please discuss the FR process elsewhere. Unless you've lied about your income, in my experience and observations you are unlikely to NOT receive a CLI as a result of tax return verification. 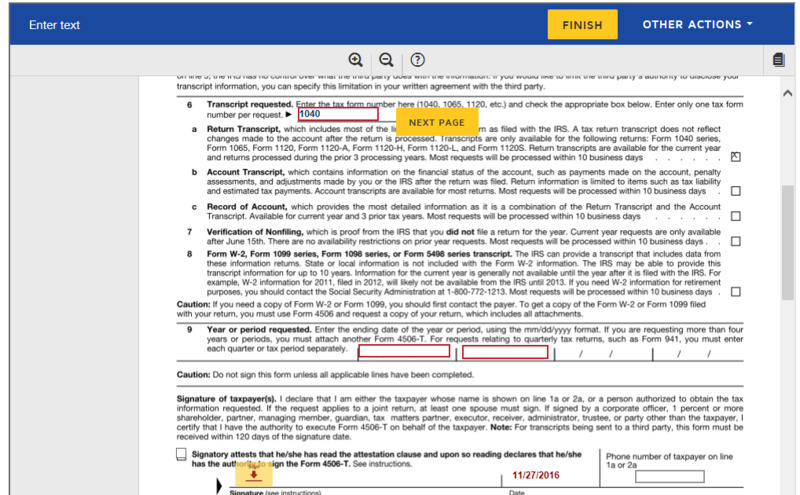 Amex pays a fee for verifying your income, so when they present you with a 4506-T they genuinely want to extend more credit to you. I have more revolving credit with Amex than any other issuer as a result of CLIs that have come from this process. I currently have $97,000 on three revolvers, plus $35,000 revolving on my Platinum (the "pay over time" feature), and this revolving credit is on top of whatever else they'd approve on the NPSL basis on the Platinum. You are NOT providing your tax return to Amex, you are authorizing them to review a transcript of your tax return to verify your income. There has been a lot of debate about what appears on the transcript. Here is one sample of a transcript I found. Here is another. I don't know which one Amex gets, or if it's either of these. The $25,000 trigger for the 4506-T request is fiction. I didn't get my first 4506-T request until ~2x that. The threshold varies with your income, creditworthiness, and probably 400 other things in Amex's algorithm. The most recent available tax year is what Amex will verify. As a general rule, your previous year's tax return will not be available for verification until August of the current year, so, for example, if you provide the form in May of 2017, make sure you specify tax year 2015 on the form. If you do your CLI request online and the 4506-T is required, the form is now presented to you immediately on the Amex Web site, and can be completed/submitted instantly online. You will still receive one in the mail, even if you submit the form online. 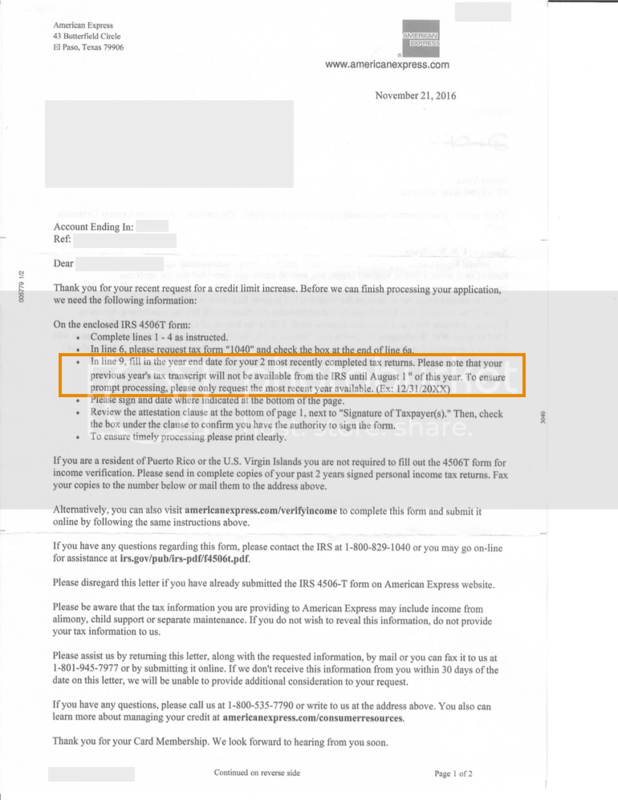 There is a lot of discussion about when you are eligible for CLIs from Amex under the standard rules, but after a 4506-T the rules are relaxed. Earlier this year I got two 3x CLIs in 18 days. Multiple CLI requests in the same year may require redundant 4506-T requests. For the two CLIs mentioned immediately above, I had to provide the form to verify the identical tax year for both. Current/future experiences with the 4506-T process will be most helpful, but feel free to rant (or rave) about a past experience as well. 11/19/16: Requested 3x CLI on my EveryDay Card. Received the online 4506-T form. The form wouldn't load in Safari on my iMac, so I'll wait for it in the mail. On 11/16/16 requested a CLI to 25k. Counteroffer of 12k. No 4506-T requested. You should be eligible for another CLI in February. Go for it! Post back if you get a 4506-T request. 11/25/16: Received the 4506-T form in the mail. I've used Chrome on Mac with my 4506-T requests and it worked both times. Your fifth bullet point about the availability of transcripts - I looked that up on the Treasury website and that's not quite the case. Transcripts are available according to this table - Mid-May if you e-Filed (and who doesn't? ), June if you paper filed. I've completed the form successfully in Safari on my Mac before. Might have been a temporary COMPUTER GLITCH at Amex. The guideline of the August timeframe for availability came from Amex, and from personal experience where my form was rejected prior to August, however it may be an Amex policy not to submit the form to the IRS prior to that. I am more than willing to revise my original prose based on direct experience from other CB members in 2017 (or based on a link to a credible 2016 CB post where a pre-August request was successful). In the "prybars" thread I posted my new $50K limit on Amex on August 16th. Member since 2006. Submitted 4506-T online in July and requested a $50K limit - approved on August 16th. I don't recall what tax year I requested. I think I requested two years prior since our AGI was slightly higher that year. FWIW, my request from August 2016 is still open; after confirming that amex has received my tax transcripts 4 times. One part of amex claims my address is "East Oak Steet NE" while my tax transcripts and Amex customer service (and all my statements from amex) have confirmed my address is "E. Oak St. NE"
The UW won't talk to customer service or me; only to the offshore CLI department. the CLI department keep claiming they are resubmitted their recommendation for approval while the UW have not made a decision yah or nay. My response has been to reallocate the limit from the card to another and close the card with the CLI request. 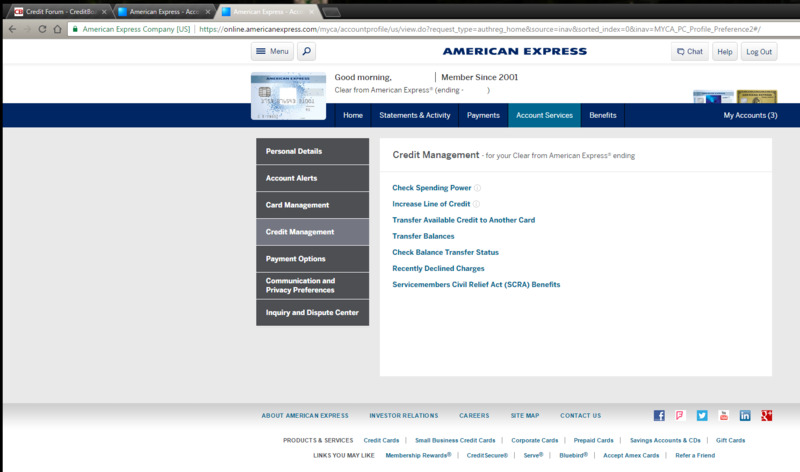 I half expect to hear that amex approves the CLI on the now closed card. 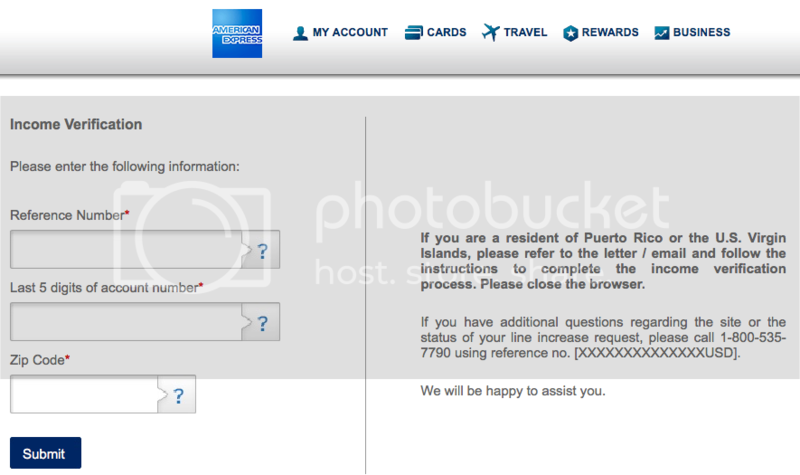 At least I will save $195 AF due to amex's incompetence. I also had fun filing my CFPB complaint for the violation of Reg B.
I still can't believe that was the endgame for that request scenario. Because of that I STILL haven't pulled the trigger or my next request. Maybe so, but Amex does not use the prior year's tax return until August. I finally sat down to submit another request and the form won't load (looks exactly like what cv posted previously). No go in Chrome, even in Incognito mode. Internet Explorer just got used for the first time ever on this computer. Screenshots of the process incoming. I missed a couple screenshots as they didn't turn out quite right after the switch to IE, but that's the basics of the request. 11/27/16: The letter I received does not contain the mailing address to return the completed form, however it does contain a URL to submit the form electronically. I went to the URL, provided the reference number and a couple of account details. This time there was no COMPUTER GLITCH. Big Bear's screenshots capture the process. I also received the 15-30 day message, which is normal. Last time we went for a CLI on DW's EDP card, asked to go from $30k to $50k. 4506-T requested. Complied with the online request and approximately 2 weeks later CLI was granted to $50K. This was ~3 months ago. Nice. Hope mine goes this smoothly. That's not bad at all CTSF! I too hope this one finally goes through...successfully. Their CLI department is a disaster. Your experience is the worst I've read about. My last two 4506-T submissions also got stuck in the CLI department. In both cases, I eventually I escalated to the @AskAmex CSRs via Twitter, and was able to get the requested CLI several weeks later. I sent mine in July. Twice. Still no response. Kinda forgot about it until I read this thread. Gonna call today. Did you earn significantly more in 2015? If so, it may be of benefit to submit a new one now that would also pull 2015's 1040. Unfortunately no. I made the same money the past 2.5 years now but I get a raise starting January 1, 2017 But my income is pretty good (over 150) and I own my house free and clear - so not sure why AMEX has not responded. 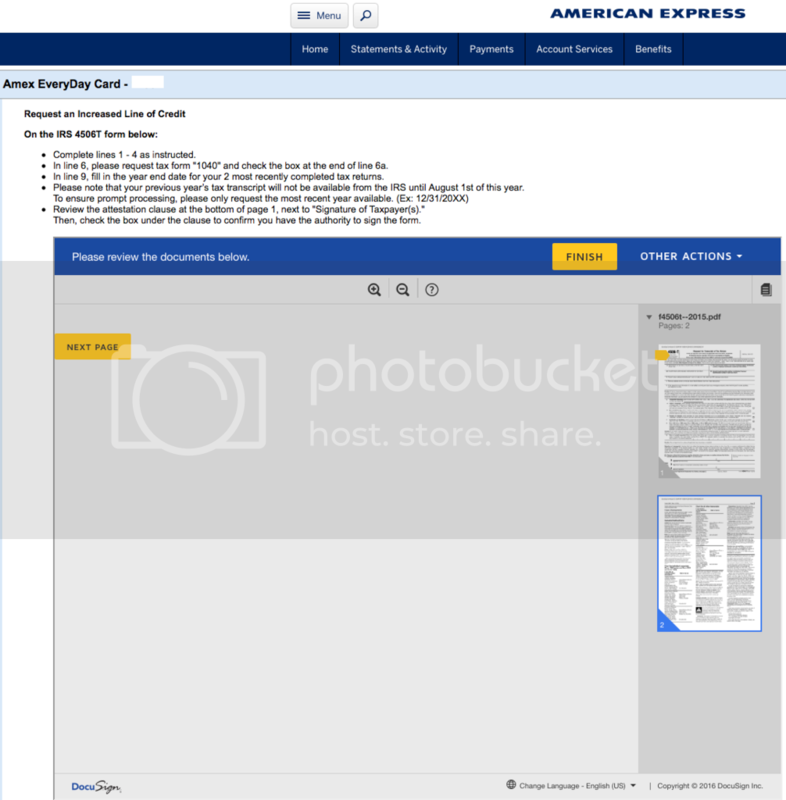 Try escalating this via @AskAmex on Twitter. Stay close to your Twitter Machine, and within a couple of hours of your Tweet you will be logged into your Amex account and chatting with a rep who will get resolution on this for you within a matter of days.